• PDS (POWER DISTRIBUTION SYSTEM) is the system that BCM controls with the operation of the pushbutton ignition switch and performs the power distribution to each power circuit. This system is used instead of the mechanical power supply changing mechanism with the operation of the conventional key cylinder. • The push-button ignition switch can be operated when Intelligent Key is in the following condition. Refer to Engine Start Function for details. 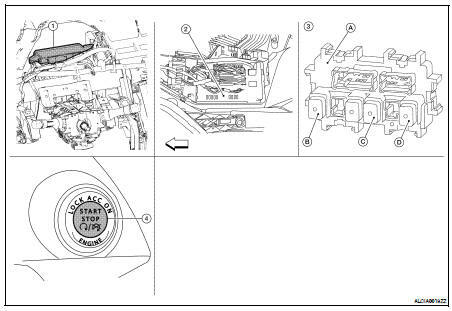 • The push-button ignition switch operation is input to BCM as a signal. BCM changes the power supply position according to the status and operates the following relays to supply power to each power circuit. NOTE: The engine switch operation changes due to the conditions of brake pedal, CVT selector lever and vehicle speed. • The power supply position can be confirmed with the lighting of the indicators near the push-button ignition switch. The power supply position changing operation can be performed with the following operation. NOTE: • When an Intelligent Key is within the detection area of inside key antenna and when it is inserted in to the key slot, it is equivalent to the operations below. • Unless each start condition is fulfilled, the engine will not respond regardless of how many times the engine switch is pressed. At that time, illumination repeats the position in the order of LOCK→ACC→ON→OFF. *1: When the CVT selector lever position is N position, the engine start condition is different according to the vehicle speed. • At vehicle speed of 4 km/h or less, the engine can start only when the brake pedal is depressed. • At vehicle speed of 4 km/h or more, the engine can start even if the brake pedal is not depressed. (It is the same as “Engine stall return operation while driving”.) *2: When the CVT selector lever position is in any position other than P position and when the vehicle speed is 5 km/h or more, the engine stop condition is different.